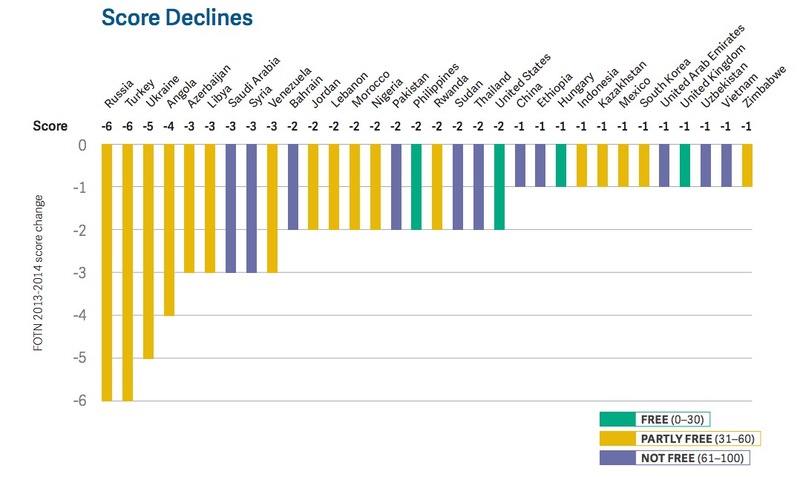 Internet freedom has declined around the globe, once again, in 2014. A new report out from Freedom House shows that 36 of the 65 countries evaluated showed a negative trajectory since May 2013, with Russia, Turkey and the Ukraine facing the biggest downturn in internet freedom. 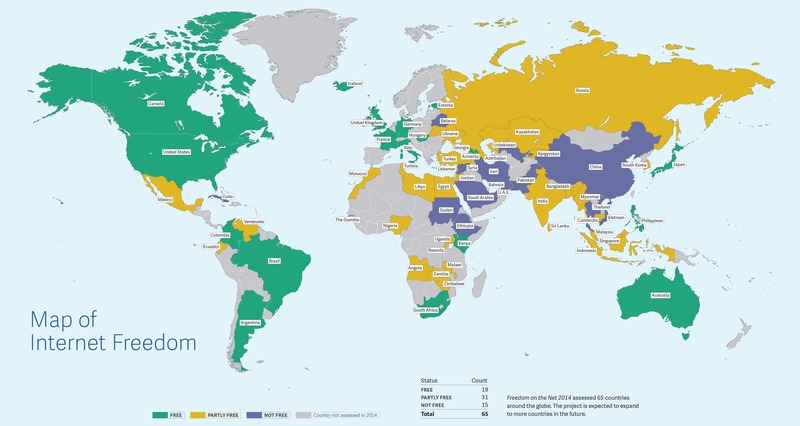 Iran, China and Syria (the last due to the danger for civilian journalists) remained the worst abusers of internet freedom, according to the Freedom on the Net 2014 report. A major reason for the decline is a flurry of new laws from countries around the world to block or censor the net. Forty-one countries passed or proposed legislation to censor online speech or increase government surveillance powers, according to the report. Turkey, for example, censored its citizens from Twitter and YouTube in the wake of protests. Russia also implemented a host of laws around the Sochi Olympics and after, including asking bloggers to register with the government. Brazil, India and Belarus got positive nods for relaxing internet restrictions, but there weren’t too many strides forward in internet freedom otherwise. Iceland remained in the top spot for internet freedom, followed by Estonia, Canada, Australia, Germany and the United States. New concerns are on the horizon though, driven in part by the NSA revelations of the part year. Many governments are asking private companies to locate data centers within their respective countries in order to maintain control. There’s also been a rise in cybersecurity and malware attacks, especially from groups like the Syrian Electronic Army who attacked news sites such as the Washington Post in August and most recently the Gigya login service just last week. What about EEUU, UK. The Internet its free ? It’s so relative. In those countries, your freedom may be in danger depending what you write freely in social networks. Exist real cases about that. By the way, I’m from Ecuador too, and in my country the Internet navegation it’s free. Bad investigation (copy/paste). Is a very Wrong investigation. I am from Ecuador and the Internet Navegation is very free… because the people insult, lie and gossip. And we have access for any website.